When you arrive at a hotel, you should initially check the headboard and around the mattress tufts for the bed bug signs listed in Identification & Behavior section. Additionally, you can use a high powered flash light to look for visible bugs. Also, you should not place your suitcase on the bed or floor of a hotel room. The best place would be on the luggage stand or a table that is farthest from the bed. 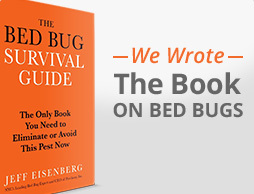 For more tips on how to protect yourself when staying in a hotel, purchase The Bed Bug Survival Guide.